Wedding Celebrants - so many to choose from! Being a wedding supplier and involved in the Wedding industry is a huge responsibility. We are the professionals that our clients turn to with problems, questions and impossible tasks requiring actions. It’s a tough gig, but when you think about what these couples are putting in our hands, it is one that has to be taken seriously. For this exact reason, wanting to supply our clients with the very best service possible, we work closely with a small selection of preferred suppliers. These tried and tested providers have displayed to us the same professionalism and dedication that we adopt with our events, hence we are thrilled to recommend them with full confidence. Religious or civil? This choice is pretty easy for most people, however when selecting a marriage celebrant you definitely want them to incorporate your religious beliefs, vows and prayers even when not marrying in a church. Or vice versa – and not want any religious affiliations at all. Friendly? Obviously sounds quite simple, however this person sets the tone for the beginning of your life together. You need to make sure you like the way they talk, smile, gesture and their personality suits the two of you. It is also important that they are contactable and you feel comfortable calling them with any amendments or issues you may have. Tone – what kind of atmosphere would you like? Some couples like the seriousness of a traditional wedding, others want a fun joke-about giggly ceremony. If the latter, does your celebrant make you laugh? Photogenic. I know this sounds really vain, but your celebrant is most likely going to be in all of your photos at the ceremony. You want to make sure they look nice. 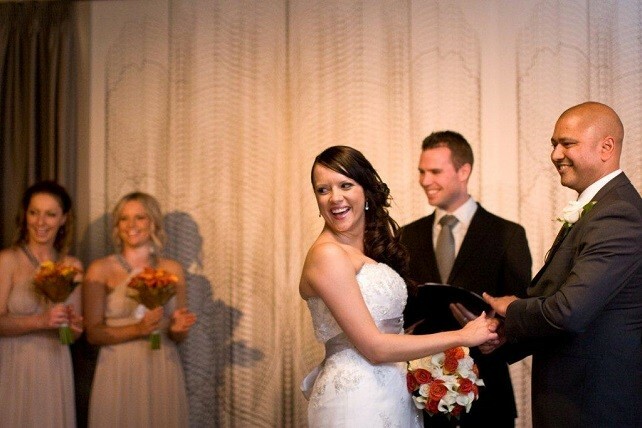 Fees – when you book your wedding ceremony with us, a free ceremony rehearsal the week before your big day is included. This is something you will need to check is free of charge – it’s not uncommon for celebrants to charge for a rehearsal PLUS travel time! Still on fees, find out up front what they charge and exactly what that includes. Hidden costs are nobody’s friends. Make sure they are accredited! Read more about the finer points of making your Wedding Reception stand out. ← 30th, a Wedding and some Greeks!